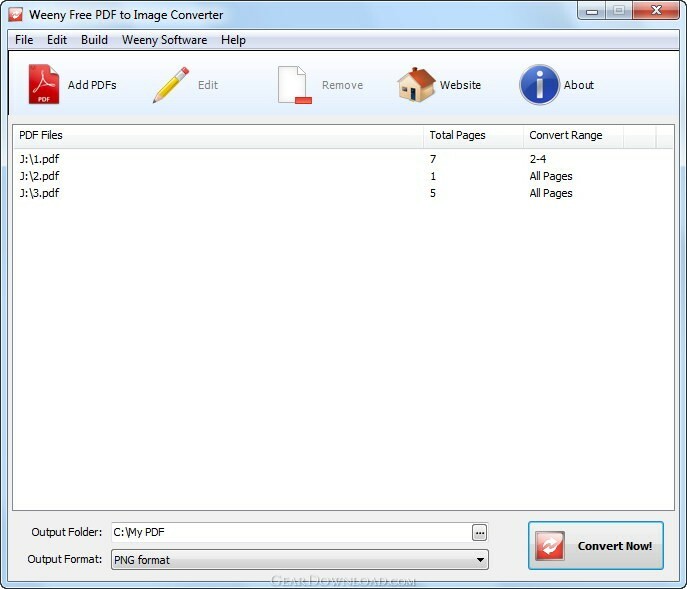 Weeny Free PDF to Image Converter - Batch convert PDF document to image file. Weeny Free PDF to Image Converter is a free and easy-to-use PDF converter software to batch convert PDF document to image files. Just add PDF files to the list, select output directory, choose image format such as JPG, TIF, BMP, PNG, PCX or GIF. And click "Convert Now!" button to start converting. Weeny Free PDF to Image Converter can convert the whole PDF document to one single image file or extract all images from a PDF document. Weeny Free PDF to Image Converter doesn't require Adobe Acrobat Reader installed. Weeny Free PDF to Image Converter doesn't depend on any print driver so it will not install any print driver on your computer. This download (pdf2imageconverter.exe) was tested thoroughly and was found 100% clean. Click "Report Spyware" link on the top if you found this software contains any form of malware, including but not limited to: spyware, viruses, trojans and backdoors.